Our waterbed hardware pack is everything you need to assemble your hardside waterbed frame. The complete hardware package includes all the metal brackets and self tapping wood screws needed to assemble your hard side waterbed. See our tips below. Contact us for complete installation instructions and specifics. 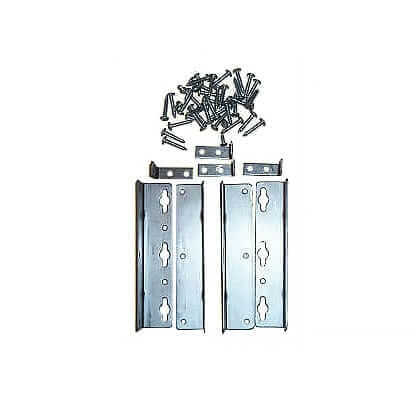 This waterbed hardware pack is necessary to connect your wood side frames together. The bigger brackets are specially designed with large slots to avoid knots or old holes in the wood. If you must use the slotted holes use opposing slots so the bracket cannot slip out of place or come loose. The corner bracket also includes closed in holes that secure it into place firmly and can also be used with one of the closed in holes. Heavy duty L Brackets are included which fasten into the inside of your wood waterbed frame. Make sure the screws are not longer than the thickness of your side frame or else they will break through the finish when screwed into place. If you are concerned about making the sides of your waterbed stronger and more secure we can supply extra screws and brackets with your hardware package. Please call us for help with this. This is perfect for people of size.